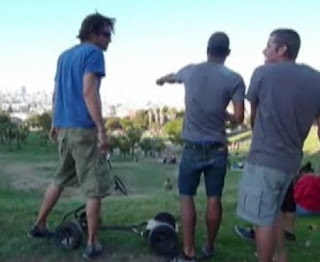 bg/ish: "We're the stars of CCTV"
I'd made reference to the day we bombed the grassy hills of Dolores Park in this blog before, but I admit I quite surprised to head over to Mission Mission today and see your boy bg standing atop the park next to that little kart of death. As it turns out, some women sitting on the bench behind us were getting some of the madness on video. It's not a terribly exciting video, although Chewie almost gets rubbed out, and although my crash goes mostly unseen, it's apparent by the reaction of the onlookers. Aptly titled "Life Size Pinewood Derby", enjoy this brief clip of our insanity.